The Diaghilev and de Basil Ballet Foundation. Anonymous sale, Sotheby's, London, 30 April 1964, lot 201. Anonymous sale, Sotheby's, London, 8 July 1965, lot 260. Anonymous sale, Sotheby's, London, 3 December 1981, lot 640. G. Detaille & G. Mulys, Les Ballets Russes de Monte-Carlo 1911-44, Paris, 1954, pp. 154-5 (illustrated in situ). J. Thrall Soby, Joan Miró, New York, 1959, p. 71 (illustrated in situ). Exh. cat., Miró en escena, Fundació Joan Miró, Barcelona, 1994, pp. 98, 106, 110 (illustrated in situ). J. Dupin, Joan Miró, Catalogue raisonné, vol. II, Paintings, 1931-1941, Paris, 2000, no. 414 (illustrated p. 71). 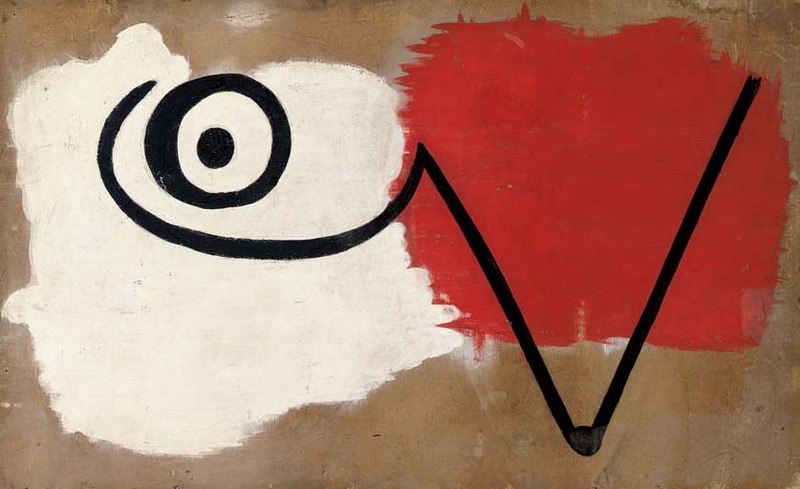 The present work was painted by Joan Miró as part of the set decoration for Léonide Massine's ballet, Jeux d'enfants, with music by Georges Bizet and scenario by Boris Kochno. Jeux d'enfants was first performed by the Ballets Russes de Monte-Carlo in Monte Carlo in 1932. Miró not only designed all the costumes and the set but also painted the front curtain and the props and executed several paintings to adorn the stage (see fig. 1).